Making a desirable impression is always important in life. It doesn't really matter whether it's a job interview or a party that you're going to be meeting new people. Wearing the right dress shoes is important and you can't go wrong with wearing Giorgio Brutini dress shoes. These Giorgio Brutini dress shoes feature a black and white spectator style made of gator print calfskin leather and have that head turning style that makes others stop and check your feet out. 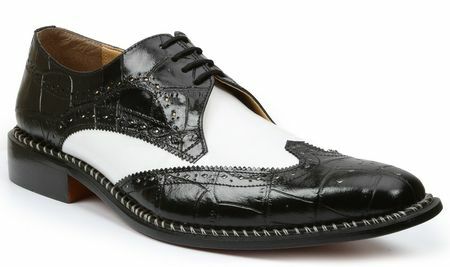 If you're into wearing vintage style Zoot Suits or maybe you just like to roll to the classic vintage style of the 1940s, You're going to do just that wearing a pair of black and white spectator shoes that have attitude for days and days. Swing Dancing or just dressing like a Gangster you see in vintage gangster movies, a pair of Giorgio Brutini black and white spectator shoes will bring you to that zone. These shoes are the perfect thing to wear if you're going to be wearing a period correct zoot suit costume to a party or if you're in a theatrical group on stage where you're trying to replicate the 1940s and need a zoot suit costume for your actors on stage.